During Friday's session, Gold prices fell sharply after the US Dollar and equities were lifted by improved risk appetite amid hopes for a resolution in the China-US trade war. Now the focus shifts on the Chinese GDP, retail sales and industrial production data for fresh trading incentives while the risk trend will continue to remain the main driver. However, the yellow metal already began to attempt a recovery in anticipation that disappointing Chinese growth numbers would re-ignite China slowdown concerns and eventually risk-aversion across the markets. 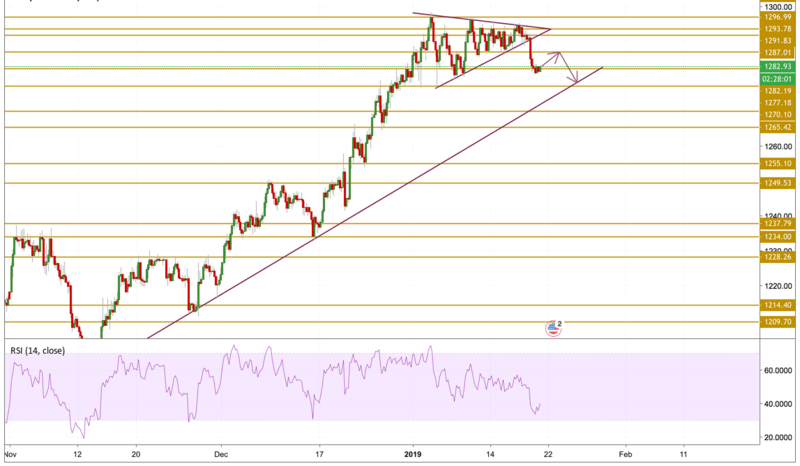 Gold prices moved lower during Friday's session after the lower band of the triangle on the chart was violated to the downside. Even though the overall trend remains bullish, the bears now are putting some pressure with the key $1280 support zone being tested. The price is currently attempting a recovery hovering just below the 1283 level, however, the momentum is still bearish as the RSI points out. Today we will be focusing on the $1287 resistance level before we can most probably witness any further downside towards the purple trend line.